The following proposals are designed to be modular “plug‐and‐play” components; they can be executed individually in any order, or simultaneously in any combination. Each addition compounds the value of Phase I as well as increases the value of the whole because all the parts work together synergistically. Of the eight projects, six directly replace or modify existing proposals and fit within the same budget commitments. Turn Penn Station into a grand civic entranceway to the city—one in which all New Yorkers can take pride. RUN is compatible with past proposals from Governor Andrew Cuomo and others. Rather than decking over Sunnyside Yards, build a new regional rail station at Queensboro Plaza to anchor and support a growing Central Business District. Replace most of Sunnyside Yards by expanding the new Port Morris train yard. Build the branch of the Second Avenue Subway from East Harlem to Dyre Avenue in the East Bronx as the MTA originally proposed. Build longer runways to allow full‐size passenger jets to land safely and travel to any destination. Add an AirTrain link to the Port Morris hub to make LaGuardia the best‐connected airport in America. Port Morris would be the ideal site for a convention center if Projects C and D were constructed. Relocating the Javits Center would also allow Midtown West to continue to grow. Extending the 7 and the PATH train to Secaucus will increase capacity for commuters from New Jersey, and add to the value of the expanded hub at Secaucus Junction. New PABT terminal at Secaucus will provide inter‐modal transfer opportunity outside of Manhattan, alleviating congestion in the Lincoln Tunnel. By reusing underutilized or abandoned assets, RUN creates a network capable of serving all of Northern New Jersey, not just parts of Hudson and Bergen counties. 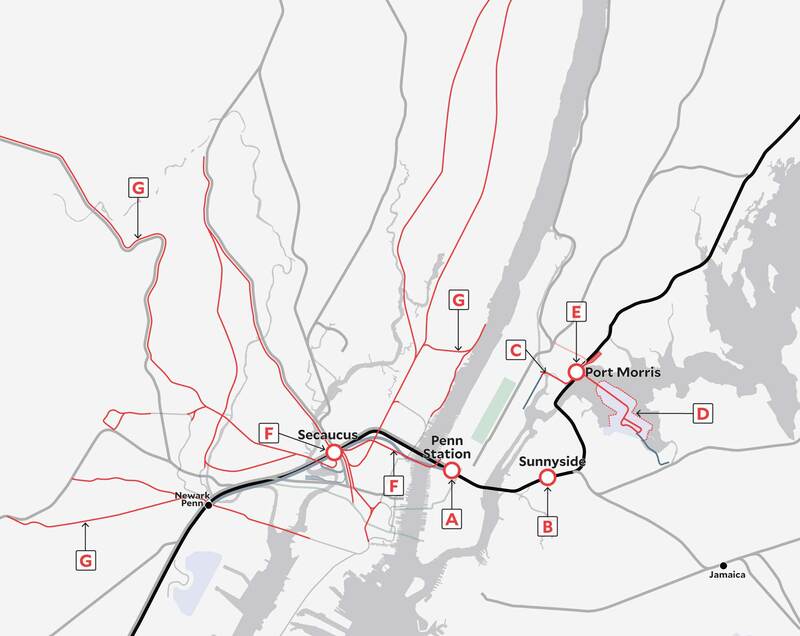 Today, the New York metropolitan region has a patchwork of incompatible rail networks. Upgrading, extending, and standardizing electrical systems would improve service, redundancy, and reliability.